For those of you who aren't a friend to, or on the payroll of "the do.com", you may be unaware that I am the Founder, CIO, and Moral Compass of daveobrien.com, and I work in the Information Technology Field. Therefor it is my job to know more than you about computers. I lived through the dark days that were Y2K, and all the wailing and panic that it created. What was billed as what would be the end of our functioning civilization, wound up being more like when you are sitting on a real sturdy oak dining room chair, and you do a one-cheek-sneak and make a cute little piccolo fart that everyone laughs at, even your wife who has no time for such vulgarities. So if you have pulled yourself away from American Idol for long enough, you may have noticed a news story about Daylight Savings Time coming early starting this year. 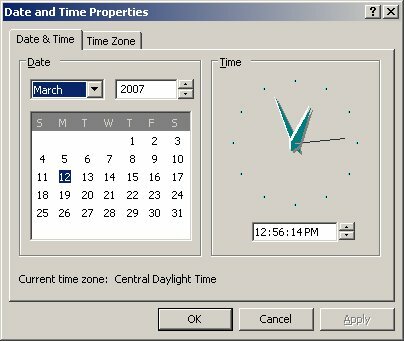 Your computer may not be aware it needs to change the time at 2am on Sunday March 11th. It kind of snuck up on everyone after congress passed the law that made for an early Daylight Savings Time this year. "My fellow do nothing duely elected whores, no time to appropriate funding for replacement equipment being destroyed in Iraq, we have to get on this DST Buga-boo." I mean really. The news coverage has been mostly informational, but I have seen some scary slow news day Y2K-like, stock up on canned goods and drinking water stories too. The thing that will make this DST story a non-factor will be the same thing that made Y2K a non-event. Dedicated IT staffers all over the country making sure patches are applied and systems are unaffected. If you want to reach back into the archives, here is a piece I wrote about Y2K at the end of 1999. Since we have established that I probably know more than you about computers, I am going to tell you how it is going to go down, and what you should do to minimize the potential impact. Most people don't care if their clock is wrong or will manually change it. But if you use Microsoft Outlook or another calendaring program to schedule tasks or send out meeting requests, you should pay extra close attention to them during the weeks between March 11 and the first Sunday in April where Daylight Savings used to kick in. It can be a good idea to put the meeting time right in the subject of the meeting request. That's about it. Other than that, just check make sure you are current with your Automatic Updates. soft.com. If you have a hacked copy of Windows that wont allow you to download updates, I have included links to the files you can download and run manually. Just follow the instructions, if it says you don't need it, or you already have a patch that is newer, you are good to go. If you are running Windows 95, 98, or ME, your computer probably still uses the Julian calendar or by the time it boots up, we will be back to Standard time. Oh, and if you are running a Macintosh system, I'm sure everything will be fine because Mac's don't run on electricity, they are imbibed with the Holy Spirit or Pixie Dust or something and as we all know, nothing ever goes wrong with a Mac.